Although, ‘Tennyo-no-yuami’ is provided only for female room guests, there are other three different grand baths for other hotel guests. Sennen-no-yu’ on the 4th floor ‘Daikoku-no-yu’ on the 6th floor, and the open-air bath ‘Fuku-no-yu’ on the 7th floor is provided. Grand baths ‘Daikoku-no-yu’ and ‘Fuku-no-yu’ are alternately used for men and women in designated time zone. ‘Fukunoyu’ is laid out on the 7th floor of the ‘Taihei-no-yakata’. It was renovated as open-air bath in September 2009. Inner stairway connects to ‘Daikokunoyu’ on the 6th. ‘Daikokunoyu’ is laid out on the 6th floor of the ‘Taihei-no-yakata’. The grand bath is divided into two bathtubs, one is for nuke warm and another is for rather hotter water. Another inner grand bath called ‘Sennen-no-yu’ is also laid out in the ‘Genroku-no-yakata’ on the 4th floor. ‘Mikaeribijin-no-yu’ is laid out on the 9th floor in the ‘Genroku-no-yakata. You can enjoy seeing outside forest view from the traditional wooden bath tub covered under the roof. Although, no natural hot spring water is used, tourmaline covers the bottom of the bathtub. Tourmaline is a crystal silicate mineral compounded with elements such as aluminum, iron, magnesium, sodium, lithium, or potassium. Tourmaline is classified as a semi-precious stone and the gem comes in a wide variety of colors. You are required additional charge 1,000yen for 45 minutes bathing. Business hours are from 5:00 to 24:00. You can enjoy quite unique traditional ‘Goemon-buro’ style bath. ‘Goemon-buro’ is a kind of traditional metal bathtub heated from beneath with a floating board which the bather presses down and sits on so as not to get burned. ‘Goemon-no-yu’ is laid out on the 9th floor in the ‘Genroku-no-yakata, and is the most popular among three of private baths. You are required additional charge 1,000yen for 45 minutes bathing. Business hours are from 5:00 to 24:00. ‘Chiyo-no-yu’ is an inner private bath located on the 7th floor in the ‘Genroku-no-yakata and is suitable for family with children. The bathtub is made of expensive ‘hinoki’ timber. You are required additional charge 1,000yen for 45 minutes bathing. Business hours are from 5:00 to 24:00. More than 15,000 of day trippers without staying overnight enjoy taking onsen at ‘Furutakiya’ annually. 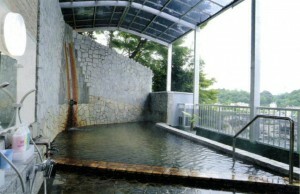 However, only inner grand baths are available for these visitors to the onsen inn. As a certified guide-interpreter in English and also a writer of the website “Cool Japan Guide”, I am very happy to introduce “Furutakiya” in Iwaki-yumoto Onsen. If you have something to ask, please feel free to contact us. Thank you for your kind cooperation, I am looking forward to your contact.